You're shopping at AmmoMan.com, so clearly you've got brains. Trouble is, zombies like to eat brains. Keep them in check with your 1911 or other .45 ACP pistol and this Hornady Z-MAX ammunition. 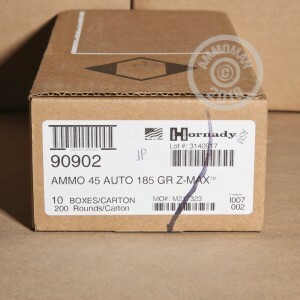 Based on Hornady's widely used Critical Defense series, these cartridges come in boxes of 20 and fire a 185 grain Z-MAX hollow point bullet that puts the undead down quickly with impressive penetration and reliable expansion. 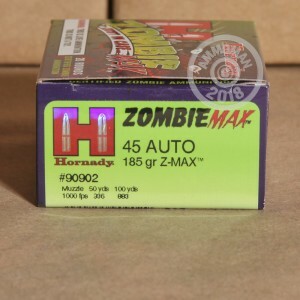 Z-MAX ammo is made at Hornady's headquarters in Grand Island Nebraska to the same standards as Hornady's premium self-defense product lines. 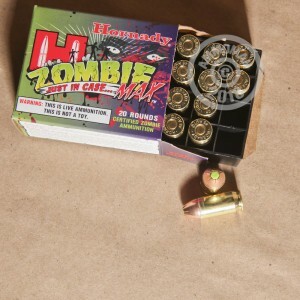 It's the ammo you can count on when the zombie apocalypse hits! It's likely you'll need more than 20 rounds if zombies come knocking at your door. Grab a few boxes (or any items totaling over $99) to get free shipping from AmmoMan.com!